We are all waiting for the start of the World Cup in Brazil and we are only 19 days away (today 26th of May) from seeing the best of the best in football both as national teams and as individual players. But there is another team from which we haven’t heard too much, at least not as much as the ones being generated around the national teams. This team is a dream team, a team of scientist, researches, designers and of course 3D printer specialists. What is the goal of this team? This team is working to provide for the first time ever a paraplegic the opportunity of “free” movement with the aid of an exoskeleton operated via EEG (electroencephalogram). This will be the pinnacle of a venture that started around 2008 when Miguel Nicolelis, a neuroengineer from Duke University in North Carolina demonstrated the ability of a monkey to control a robot by thought alone, this break thorough in science lead to a new project under the name of Walk Again Project. The team from Walk Again Project is leaded by the engineer from Duke, scientist, researchers and designers from Germany, France and other US institutions. 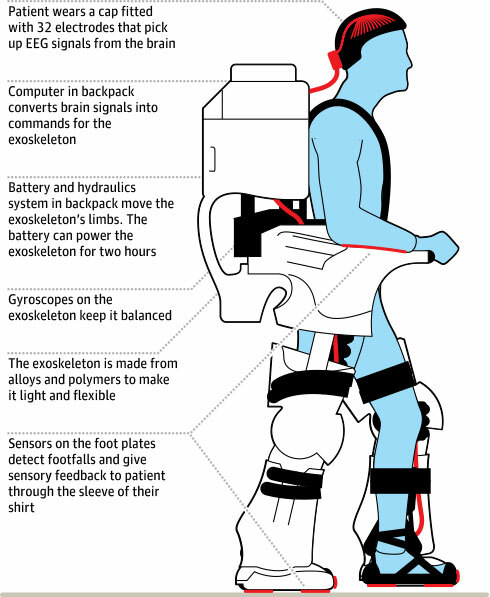 Through the design process of the exoskeleton, 3D printing had an important role, although the whole suit is made of light weight metal alloys and hydraulic pumps the interphase between the users head and the rest of the suit had to be made via 3D printing process. In order to get the signals from the users brain to the suit a perfect fit between the head and the suit, Colorado State University’s Idea-2-Product 3D printing labs were responsible for creating a flexible piece of padding that would ensure a perfect and custom fit for the final user. Even though 3D printing did not had a much bigger role in the production of the exoskeleton providing with a perfect fit solution was itself a challenging task, especially because on the day of the opening match in Sao Paolo, Brazil over 1 billion people will be watching what promises to be a ground breaking moment in the history of 3D printing, sport and medicine. We are still to know who will be the user making history, since the teams are working with nine paraplegic men and women on an age range between 20-40 years olds. If you are interested in finding more about this project, see some of the videos in the break as well as a TED Talk demonstrating the first experiment that led to Walk Again Project, a monkey controlling a device miles away only with his thoughts.